Heavy manifest trains head south with lumber from the Pacific Northwest. Doublestacks, grain, crude oil trains, the Gilchrist Local, and Amtrak�s Coast Starlight head back and forth through the beautiful countryside. Adding to the interesting mix of traffic, BNSF runs via trackage rights between Chemult and Klamath Falls. Dmacleo (Etna ME US) on 2016-10-20 07:38:45. Can't go wrong with 7idea stuff,they are nailing it. Beautiful shots good narration. You really should have part one though and watch it first. mySP7377 (San Diego, CA.) on 2016-04-11 23:27:10. 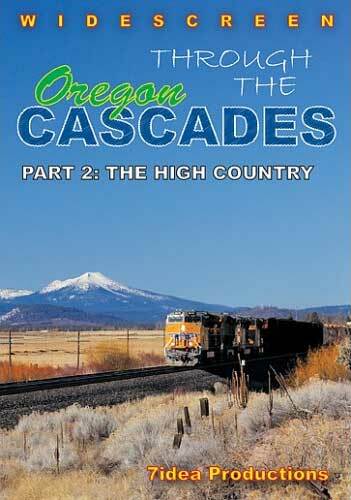 A great DVD another classic from 7Idea.....excellent photography narration maps and graphics all come together to make a most outstanding second volume for "Through the Oregon Cascades Vol 1". Defiantly a must have DVD its filmed in all four season's with non stop heavy UP main line action, every type of train is seen from freight to double stack's, unit crude oil to grain trains......GE's latest Tier4 Gevo's make appearances and look they look great, grab a copy sit back and enjoy this fantastic DVD. Rail Buff (Southern California) on 2016-04-01 14:35:23. The usual A+ product form Aaron. However, I watched this on DVD and then on Blue Ray, back to back and could write the same review for this Part 2 as I did for his Part 1. While each has something the other doesn't, IMO they are essentially the same. Each has a lot of snow but I think it interfered with the pictures more in the Blue Ray than it did in the DVD. Sometimes it almost obliterated the photo Aaron was trying to show because of falling snow and/or snow on the camera lens. I failed to note the title of this program in DVD. It was also produced by 7Idea Productions and is titled: Union Pacific's Cascade Sub - Parts I and 2. 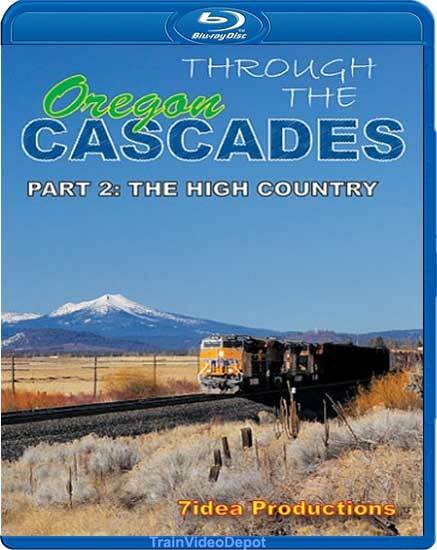 Part 1 covers from Eugene to the summit of the Cascades and Part 2 covers from the summit to Klamath Falls in both the DVD and Blue Ray versions.